This is a uniquely written book in that it speaks densely about psychological phenomenon in a fictional/narrative format. 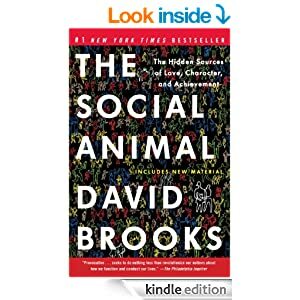 Brooks covers our unconscious mind and describes with great clarity the meaning behind all the little behaviors that add up to become our everyday functioning. This keeps it from going very deeply into any one topic but if you are interested in the behavioral sciences this is a fun book to read. Brooks starts with the meeting of two couples, their relationship and then the children they have. These two children subsequently meet and Brooks takes them through all of their struggles as a couple, right up to their elderly years. During this journey he reflects on their behaviors but also the behaviors of their extended families, coworkers and scores of others they interact with along the way. This is the Amazon review my friend Matthew Morine posted about my book. It has also appeared in the Rocky Mountain Christian. Years ago I heard some advice about habits. It was said that to change or start a new habit you had to practice the new behavior 21 days in a row. If you wanted to break a habit, you had to stop the behavior for 21 days straight. If this advice is true, my friend’s book is perfect for a refresher in your marriage. The author, Dale Sadler, is a personal friend of mine. We go back numerous years to the time that we both were working as youth ministers. He was doing an excellent job with a neighboring church, and we started to partner together for various youth events. This always created a positive dynamic because the young people enjoyed the added numbers and excitement. During Dale’s time as a youth minister, he also attended graduate school for marriage and family counseling. He completed his degree, and he presently has a growing counseling practice in White House, Tennessee. 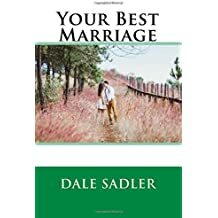 Dale takes some of his best writing and produces an excellent book on having the relationship with your spouse that you have always wanted. This book would make an excellent guide that a husband and wife could read together to strengthen their marriage. Often, healthy marriages can go into autopilot. This book will help restore some of the passion, fix a few of the problems, and generally provide a tune-up for your most significant earthly relationship. It is wise to read a marriage book a year to help keep your marriage functioning at a high capacity. The book provides 28 great chapters that are relatively short. Each chapter takes about 5 to 10 minutes to read, but will provide long-lasting advice that can help you. All of the chapters are interesting, but there are a few that really stand out. There are some highly practical ones, such as “How to Get Out of the Dog House”, “Do Affairs Just Happen?” and “Give Her What She Needs”. One of the best chapters is “How to be Romantic”, which probably every husband needs to read. An interesting chapter is “Stop Agreeing & Start Building.” All of the chapters are insightful and helpful. The strength of this book is that it is easily translated into real life. The chapter on gift giving is so helpful. The author warns men about common pitfalls most men mistakenly step into in the gift giving process. He also highlights the key dynamic in gift giving, pursue her with the gift. It is not just about the object, rather the experience. Dale asks husbands the question, “If she had five hours to herself, what would she love to do?” This is just a preview of the practical nature of this book. This is an excellent marriage book that will provide a great reminder of some of the positive behaviors that go into a great marriage. I highly recommend it. This is an incredible book if you’re looking to understand yourself, your children or human nature in general. The first half has some very insightful scientific studies involving brain research. These studies show that our actions are brought about less by well thought out decisions and more by simple habits we develop over time. 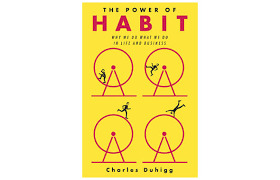 The second half has incredible stories about people who changed their habits, or the habits of others, in order to create a winning team or start a nationwide revolution. 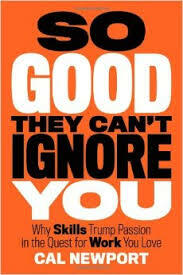 The intent of this book is to help people understand their behaviors and work to improve them. I highly recommend it. I believe that my generation; Generation X, was the last generation in the woods. We saw the advent of the video game system and air conditioning spread through small town America like wild-fire. We had reasons to stop reading and to stop going outside to make our own adventures because both needs were met through our video game consoles in our comfortable bedrooms. Today, the issue of depressed and obese children is even more of an issue because “outside” is a scary place. Richard Louv works to displace this irrational fear. I read this book as I am interested in parenting and nature. This book was a bit more nature than it was parenting, but still a good resource for those parents who wish to raise well-adjusted children, not television zombies. Louv approaches the issue of how our society has left nature in many ways that include where we live to how our children play and how we view nature. He discusses how stress, depression, and obesity are up in kids, and he believes there is a direct causal relationship with our inactivity with the outdoors. Louv believes technology obviously has its place but our inclination to make everything technology driven is keeping our children (and us adults) from experiencing anything of substance. You can see a mountain stream on the screen but you can’t touch it or catch the trout that swim in its waters. Basically, many of the ills our children experience, he believes, can be remedied by more time outdoors. There is something therapeutic about it. He even cited a study by Kapplan and Kapplan regarding Attention Restoration Therapy whereby children with ADHD were improved in their attention capabilities just by experiencing the outdoors. Lots of his material is based on studies and in contrast, our fear of the outdoors is fed by movies and a propensity to stay inside with the air conditioner; giving no thought to what we are missing. I enjoyed his references to the Bible and how the outdoors are good for you, plain and simple. He spelled out how our behavior in the past has been bad for the environment and outlined ways you can do your part to improve our land’s future. His political stance for the environment (in some cases) made good sense. For instance, hunters (typically not thought of as conservationists) should work together with those who want to save the land. Otherwise, there will be no place for either to go. Some of his other points were slanted towards “greener” living that in a perfect world would save energy, but in reality often do not. How does one person in a mass-transit vehicle save gas? It doesn’t. His vision of small yet fully autonomous villages for Americans to live in (food, jobs, homes, etc) seems a bit far-fetched to me, but he did have meaningful methods for seeing it through and maybe it can happen. This is a good read if you love the outdoors, your kids, and want to see them both get together more. Known as the pit-bull of personal development, Larry Winget brings his no-nonsense brand of logic to the parenting genre. Winget’s primary point, as the title suggests, is that you are responsible for your children. No amount of excuses can change this. He starts off early in the book and makes concessions about the fact that his advice is not for everyone and that he cannot address every single parenting dynamic out there such as parents with special needs children. He admits his limitations repeatedly, but does speak with great authority based on his failures and successes in business and in life. This book is for parents who do not have control of their children and who want to take it back. However, I would only recommend it for motivation rather than learning actual parenting skills. While 95% of what is in the book is good, the remaining 5%, to use Mr. Winget’s words, is stupid. He discusses the importance of your child’s signature on a document. While this is good advice, it is not sage wisdom. Another weak point is that much of Winget’s words are based on his opinion and Facebook surveys that he conducted. These are good springboards for his manuscript, but they are not regarded as resources for rich family research. Some of the things he recommends can actually cause people to end up right into what they wanted to avoid. Bad Advice Number 1 – He suggests that adults should live together before they get married. Studies have shown that this does not improve the chances of marital success. Furthermore, it is not even about whether or not people live together but more about their level of commitment and character. Bad Advice Number 2 – He says to let your children figure out their choice in religion. Certainly, a child’s faith should be their own, and not their parents’, but who knows what a child will come up with if he or she is influenced by the wrong people. Winget is tough on a lot, but with this point he is very weak as children need guidance even in their spiritual beliefs. He discusses very basic parenting tenets like giving your children a code of conduct, discipline, punishment, and consequences. Some of these items are up for grabs as to how you actually do them in your home and Winget admits this. While Winget appears hard hitting, he is actually only being tough on the parent. For instance, he says that punishment should be the least of what you do, and he is right. If you do everything else well, you should be punishing your child less and less. Winget is a motivational speaker so his purpose is to motivate. If nothing else, Winget can help you get the confidence you need to be a great parent. REVIEW – Why They Left: Listening to those who have left Churches of Christ by Flavil R. Yeakley Jr. Very early in the book Yeakley, lays out in plain language how this study was developed, its limitations, and how it should be used. I appreciate his honesty and candor in writing a book that could have been a springboard for church bashing. Instead, Yeakley weaves a humble and loving sentiment throughout the text that says, “May all involved be closer to God after this study.” Those involved are of course the people who left, the congregations they once attended, and those who want to make their congregation a safe haven for the lost and dying. One weakness that Yeakley admits to is the small number of participants (just over 300) that contributed to the online survey in comparison to the overall membership of the Church of Christ nationwide. While the number is not a good sampling, when answers began repeating themselves, it was obvious that a reasonable amount of information had been gathered. Much can be learned from this work. The book is divided in two parts: the background of the study and then the results. Yeakley opens up most chapters in the results section with personal stories of why people left, but always balances the narratives with obvious notes about how we are only hearing one side of the story; a strong point of the book. The names of the congregations and people are kept private. Yeakley then goes on to give a thorough analysis of the cited issue. People left for doctrinal reasons, for how they were treated, and sometimes it is the two together. There are chapters on instrumental music (the largest reason people left), homosexuality, and even how churches viewed evangelism. So, a good study will be had on these various topics. Yeakley is very clear when he says that doctrine should not be changed to please those who disagree. Amen! However what should be taken away from this study the most is the overwhelming idea that we should be careful with how we handle people and the Gospel; otherwise, we may lose those who need it the most. This isn’t my normal type of book, but I heard one of the stories in a podcast and decided to check it out. The book’s sub-title in 2010 was “A Modest Bestiary.” This in no way summarizes the actual contents. However, the sub-title in 2012 reads, “A Wicked Bestiary.” This is much more descriptive of this work that could also be labeled The Twilight Zone for Animals. In Squirrel Seeks Chipmunk, Sedaris works to illustrate the dark side of humans through the normal or not-so-normal behaviors of animals. In some of these short stories they are going about their business as normal rodents, mammals, and amphibians but in others they hold jobs like journalist and philanthropist. The Highly Sensitive Person (HSP) is a self-help book written for people who are nervous, cry easily, and can’t seem to handle situations that most endure with ease. Be informed that HSP is not an actual medical condition found in the DSM (mental disorders handbook) but rather a personality trait that Aron has heavily researched and defined herself. Much of the book references Carl Jung, a Swiss psychiatrist whose work typically has the final say in all things regarding personality. Aron relies heavily on Jung using his concepts as a springboard to define her own theory. This weakened the book. Her description of spiritual experiences by HSP’s was lost on me, and unless you have visions of little people at the foot of your bed who speak to you via telepathy, you may be lost too. There are some strengths as Aron works to help struggling individuals frame their lives and redefine a weakness as an asset. Aron talks a lot about how the brain works and how you can manage overstimulation, enabling you to step out of your comfort zone and be who you want to be. She helps you consider your childhood, school experience, and family of origin to see where this sensitivity may have originated. She lays out typical high stress scenarios and gives advice on how to handle them. Finally, she gives advice on speaking to doctors, using prescribed medications, and working with therapists. It is a comprehensive book, but maybe a little too much so. The book’s subtitle is, Changing the 8 Dumb Attitudes & Behaviors that Will Sink Your Marriage. Cloud and Townsend talk a great deal about their work with clients and how this man or woman (or both) was doing or thinking something “dumb” and how this dumb thing was ruining their marriage. The authors then relay the practical suggestions they gave to their struggling clients. Being a counselor myself I really questioned this method of writing. Did they ask their clients (and friends) to sign a release? I didn’t research this aspect of their book but I wonder. The recall of the precise session makes me question the authenticity of Jane and Rick (or whoever), but I could be wrong. I write about things that come up in sessions but I don’t say, “the other day, Michael, Stephanie, and I were in session.” I suppose they could change the names easily enough. My friends think I analyze them already so I tend to stay away from such writing styles. Their tactic of offering good advice is easy to understand but the suggestions are not always easy to employ. Behavior change can be the answer to most problems in a marriage, but this plan forgets the ingredients of bitterness, betrayal, or any number of problems with the heart. Cloud and Townsend do address these deeper matters as they relay discussions with clients. However, if you or your spouse has other issues, getting help for these may also be in order. The behavior changes suggested in the book are a good start but they may not be enough unless your situation is exactly like the examples in the book. This is not a book that’s going to move you to act unless you are already there, but it is good for enrichment if you want to improve things. It would also be good for a Bible study class although their references about marriage and family in scripture are nothing new. If you are going through some serious issues with your spouse, and counseling is needed, this book would be a good supplement to that type of work as well. Overall, I enjoyed the book as I listened to two experienced counselors lay things out in a way that I probably would in similar situations with clients. If you are struggling with what seem to be simple things in your marriage, this is a great place to turn for practical, no-nonsense advice. But if you think you need more, seek that help first. Purchase this book on the Kindle.